What are you wearing for New Year's Eve? 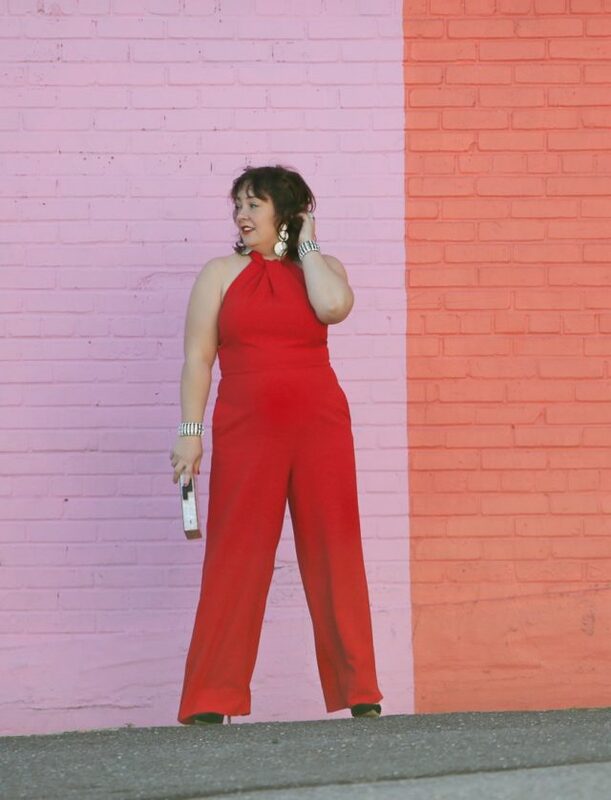 I very well may be wearing this red jumpsuit from Dress Barn. 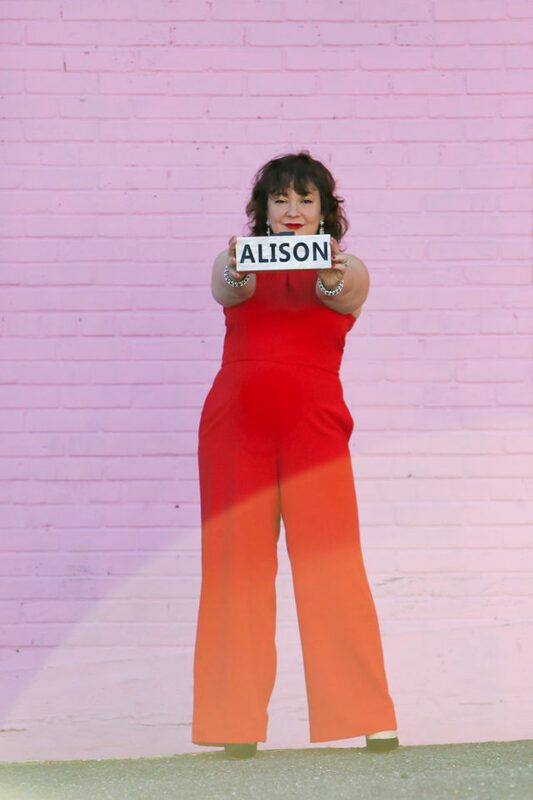 Yes, this gorgeous jumpsuit WITH POCKETS is from Dress Barn and it's super comfortable AND a super price! Dress Barn reached out and invited me to try some of their holiday collection and I found some real gems. If you follow me on Instagram (and if you're not, why aren't you? It's not just the same blog stuff rehashed) you saw this gorgeous brocade fit and flare dress also from Dress Barn. I can't believe it's on sale for less than $30 (this is the link to the dress in plus size). This jumpsuit is a bit long; I am taking it to the tailor today but for the photo shoot I temporarily hemmed the legs with some Stitch Witchery. And speaking of the technical aspects of this look, I'm wearing this strapless bra from Soma underneath; it's surprisingly comfortable while also lifting beautifully. And this is a jumpsuit you can get in and out of without a second set of hands! If red isn't your thing, it also comes in black. The accessories are old favorites; I've had these rhinestone cuffs for almost a decade. The earrings I purchased earlier this year from Nordstrom. 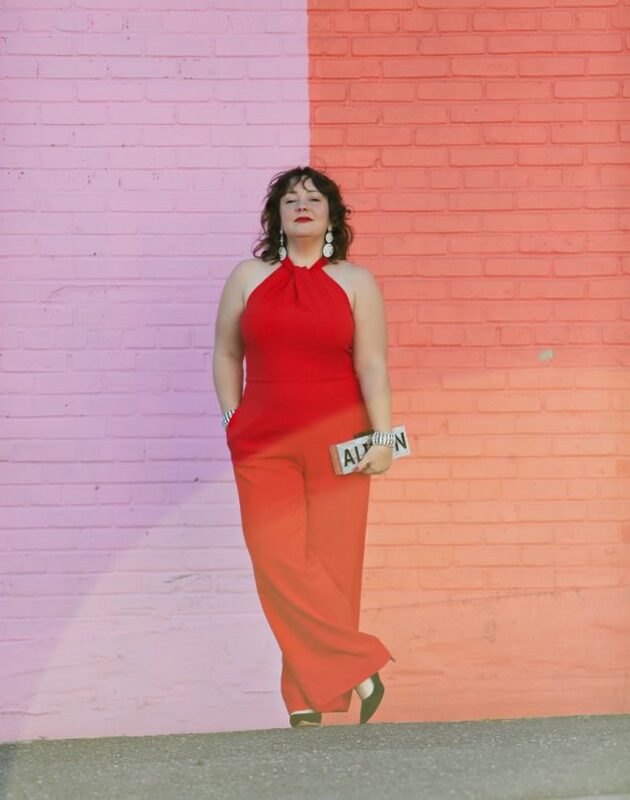 I love having some sparkly statement jewelry in my wardrobe to glam up everything from not-so-little black dresses to bolder pieces like this jumpsuit. As for the bag, I received it as a gift from the affiliate program ShopStyle last winter; but I found similar clutches on Etsy! 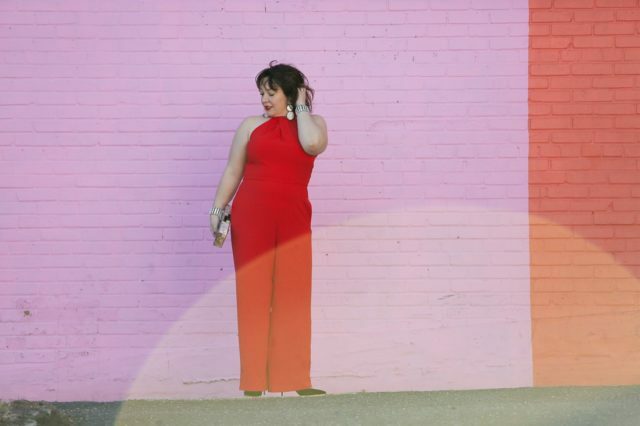 Oh wow – i can see why you would wear this marvelous red jumpsuit for NYE! 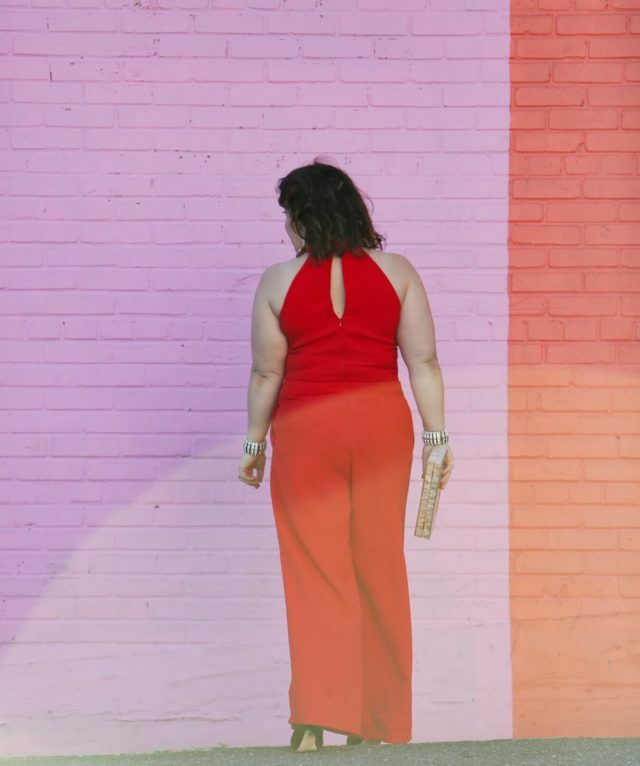 Front or back view— ylook fantastic in this red POWer suit. 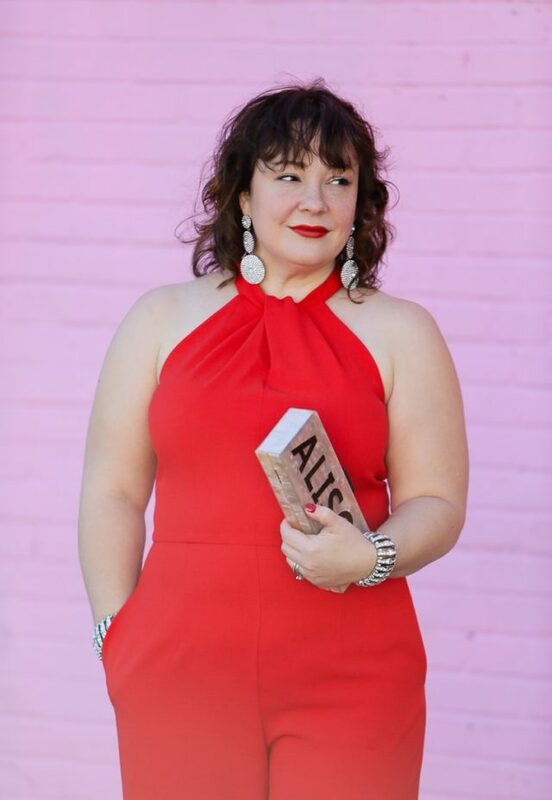 So much more than just the usual red Christmas dress at a holiday event. 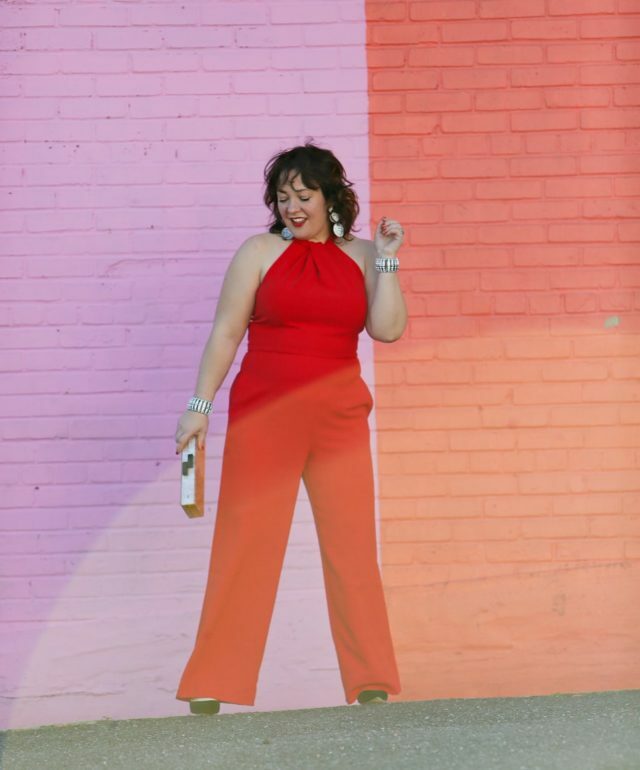 the jumpsuit…..OMG this is great….for me, Dress Barn is one of these weird retail places, when its good, its really really good, but when its not its horrid…. You look spectacular in this outfit. Now you need a party to go with it. Also, I love the current iteration of your hair style. Legs for days! But nothing looks good enough to convince me into a strapless bra … no matter how comfy you swear they are. You look so fab in this! You look beautiful! Thanks for tips! Definitely going to try the strapless bra. Nice! I love that it has pockets. I would not have guessed Dress Barn. Though I did use to have a great mock wrap dress from them. Gorgeous! And pockets—WOW! Women love & need pockets too! You look Fab!!!! A terrific look for you. Alison you look adorable in this!